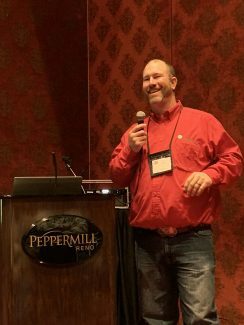 Ryan Sexson, Nenzel, Neb., shared his tips on stockmanship and grazing management at the recent National Conference on Grazing Lands in Reno. Sexson is a Nebraska Grazing Lands Coalition board member. Determination, hard work and a willingness to learn have been key to Ryan and Jamie Sexson's ranching efforts. Ryan and Jamie both grew up in the Nebraska Sandhills with a passion for ranching, but were often told there was no future for them in ranching. After various jobs on and off ranches, in 2014, the couple was able to lease a small ranch near Nenzel, Neb. Today, they are raising their three young children — ages 11, 9, and 8 — in the ranching lifestyle as they custom graze and calve heifers and cows. Ryan also still does day work for area ranches. Stewardship of the resources in their care — including rangeland, livestock and relationships with people —– are a top priority to the Sexsons. Ryan has strived to continuing learning throughout his ranching journey. He has participated in the Holistic Resource Management course, as well as attended the Bud Williams stockmanship class and several other educational seminars and classes. Additionally, he is a board member of the Nebraska Grazing Lands Coalition. Key to their approach is looking at their operation holistically, recognizing that their choices and management of grazing, animal handling, even family time, are all interconnected. Also integral says Ryan is recognizing that grazing management is only one part of the equation; stockmanship also has a role in efficient management of the range and animal performance and health. Sexson describes stockmanship as a system of observation and mindfulness coupled with pressure and release that allows the stockman to better handle livestock by building relationships with the individual animals based on trust. He said that attending a stockmanship school in 2005 prompted a different way of thought for him with regards to livestock and grazing management. "It was an epiphany for me; it changed my life," he said. After the course he came home and moved 600 cattle, and said, "That move, prior to the stockmanship course would have taken four to five hours by myself with a dog," Sexson said. "When I'd have finished with that move, I would have had unpaired cattle that I would have had to attend to, and I would have to come back in the afternoon or the next morning and fix some things." After the stockmanship school, however, Sexson was able to get the move done in an hour and a half. Sexson began using the stockmanship skills he learned. It lessened his workload, but he also noticed it impacted the range. Notably, Sexson shares the story that in the drought years of 2005 and 2006 under similar growing conditions, he had more grass reserves at the end of the 2006 growing season than the previous year. "I had more range left," he said.He attributed the difference to his change in handling the cattle and better use of stockmanship. As a result, Sexson believes the cattle were less stressed and could graze more efficiently. "I believe when people are relaxed, they do better and livestock are the same," he said. "We've all seen cattle that are continually walking; they are not relaxed. Whereas, content cattle graze and utilize what they are eating more efficiently." More recently, Sexson has come to recognize that stockmanship is also about handling people in a manner that is inclusive and not stressful. "When you develop stockmanship skills, it can also take stress off the people," he said. "If you can't bring your family along — if they don't want to carry on your legacy, then what are you doing it for?" Through stockmanship, Sexson said his kids can often work cattle with minimal assistance. He and his family are able to load a lame bull into a stock trailer in the pasture without any corrals. And, the Sexsons have cut their cattle working days in half. To document that stockmanship truly works — and in an effort to share these positive examples of animal handling — Sexson has shared several videos of his real-life stockmanship examples on YouTube. View them at https://www.youtube.com/channel/UC1UUgADwOcKgWkTeljm2GBA.